The Peoples Republic of China has a flag that features primary colors of red and yellow. Use these color values if you need their national colors for any of your digital or print projects. Follow this link for the rest of the Asia flag colors. 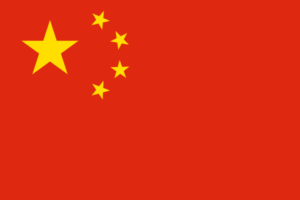 The flag of China has one large yellow star in the upper left corner and four smaller stars in a half of an circle to the right of the larger star. The rest of the flag is a solid red color. The stars represent the relationship of the people of China with the government.